“Hey, look Mehebub over there! Machwala dada is having Dim Bhora Parshe Mach! Let’s pick some. I will make Shorshe Bata diye Parshe Macher Jhal. It is been Long when we have had it with steamed rice.” this was me to Mehebub upon seeing fresh Mullet aka Parshe mach at Patuli floating market a few days back. Mehebub did not oppose and that was not surprising. He, after all, loves fresh Parshe that too filled with Roe. Pasta, on the other hand, cherishes Parshe mach as well, however, she is not allowed to eat Parshe mach on her own. I still am not confident about Pasta’s capability of handling smaller fishes. Parshe is one such fish. She is allowed to have it whenever I am at home for lunch or dinner so that I can debone the fish for her to eat! For that matter, Pasta, in fact, loves fresh water small fishes. 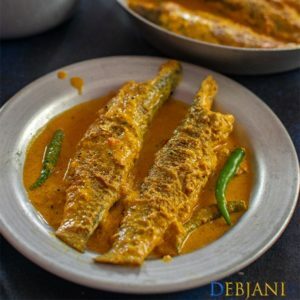 Here I must mention; she just like her Dimmi (my mother) loves Macher Jhal prepared with any fish! 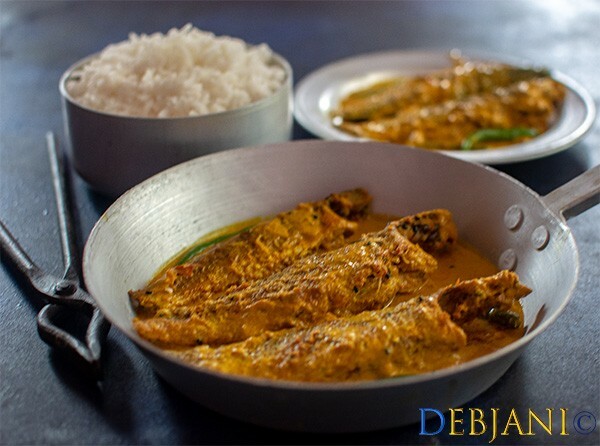 Macher Jhal basically is a gravy based fish dish where the gravy is prepared with Mustard paste. I cannot imagine my mother not having Jhal in any form (either with fish or veggies) at least twice a week! Talking about the Jhal prepared with veggies, I just now have realized I have not written the recipes of Bori Alur Jhal, or Danta Alur Jhal or Borar Jhal so far! Needless to say, I am going to post the recipes soon here. Shorshe Bata diye Parshe Macher Jhal! Coming back to the Shorshe Bata diye Parshe Macher Jhal; this is nothing but fresh mullet cooked with a paste of mustard seed. The recipe is quite easy and calls for very few ingredients apart from the fish. I prefer to make the mustard paste with a mixture of white and black mustard seed. You can, however, use either type to make the paste. You can even use mustard powder also instead of the paste. Apart from that, Mustard oil is a must while making this dish. 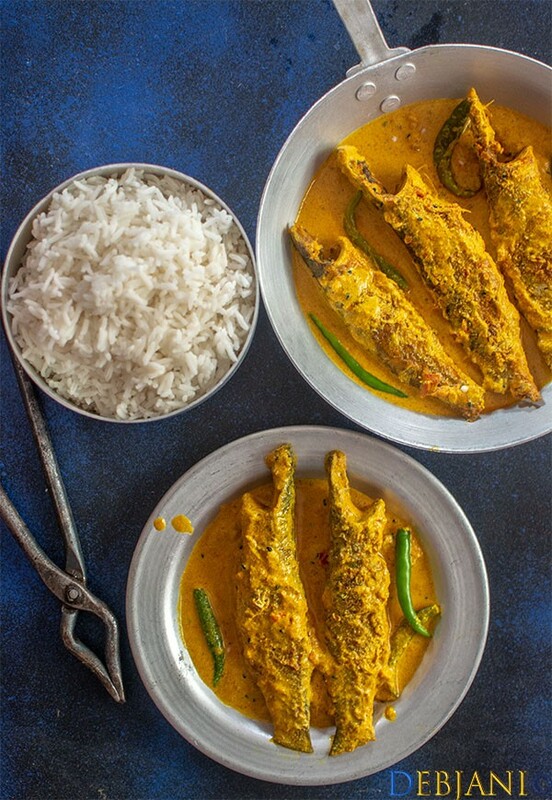 The pungency of Mustard oil makes this dish more flavorful. A few green chilies, tomato and nigella seed and also salt are what you need to make Shorshe Parshe. 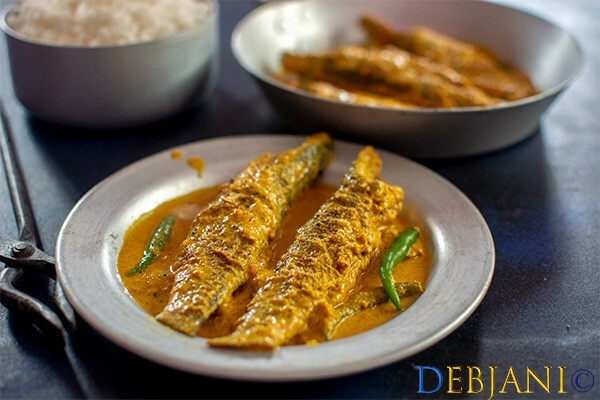 Shorshe Bata diye Parshe Macher Jhal is a famous Bengali mustard based Mullet fish aka Parshe fish curry. Black Mustard Seed: 1 Tbsp. While Mustard Seed: 1 Tbsp. Nigella Seed/ Kalonji: ½ Tsp. Red Chilli Powder: ½ Tsp. Clean Parshe Mach by removing the unedible portions from head side. You can ask your fish vendor to clean the fish. You may refer to the picture for cleaned fish. Now wash the fishes under running water. Sprinkle half of the Turmeric powder and salt over the fishes and coat the fishes properly with the spices. Leave marinated fish for 15 minutes before frying. In the meantime soak both types of mustard in warm water for 15 minutes. Now take mustard seeds along with two green chilies and ½ tsp. salt and make a smooth paste either using a processor or mortar pestle ( Shil Nora/ Shil batta). Mix the paste with half a cup of water and strain it through a strainer to discard the husk. Mix the husk with some more water and again strain to get more extract. Heat Oil in a Pan and deep fry the fishes from both the side. Keep the flame on the lower side while frying the fishes. Temper remaining oil with Nigella seed. Add chopped tomato followed by slit green chili and cook until tomato soften and the mixture releases oil from the side. Now add Turmeric Powder, red chili powder and also Salt and little garlic paste and mix thoroughly. At this point add the Mustard paste mixed water and mix lightly. 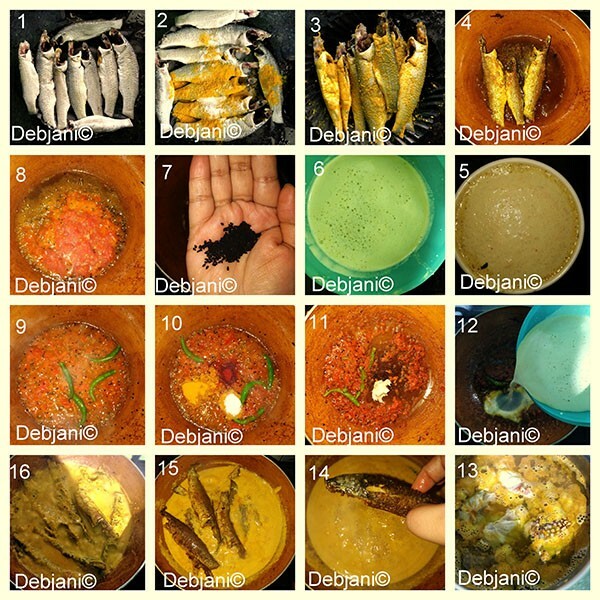 Once the mixture started boiling; add fried fishes and coat with the gravy. If required add some more water and keep boiling the curry unlit it reaches desired consistency. I prefer my Shorshe Bata diye Parshe Macher Jhal with a semi-thick gravy as shown in the picture. Serve it hot with plain steamed rice. Mustard Oil can be substituted with vegetable oil however, it gives a distinct flavor and aroma to the dish. Instead of a mixture of black and white mustard, you can use either type to make the paste. Instead of mustard paste, you can use mustard powder. For that, you have to follow the process mentioned in the packet. 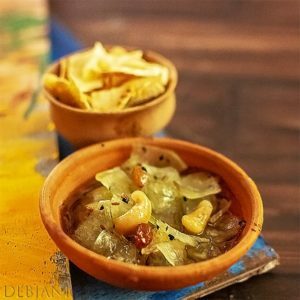 Have you tried the Parshe Macher Jhal recipe from Debjanir Rannaghar!